Rumor has it the Manhattan was invented on the island of its name in 1874 at The Manhattan Club during a party for New York’s newly elected Governor that was hosted by Jennie Churchill, the mother of Winston Churchill. The original recipe called for Rye Whiskey, Sweet Vermouth, and a dash or two of Angostura bitters with a maraschino cherry garnish. The substitution of Bourbon for Rye Whiskey came later, and it seemed to be regionally based. Folks in the North were more inclined to prefer Rye Whiskey and the South, home of Bourbon, preferred their Manhattan’s made that way. Regional preferences are still evident and I’m not sure where Denver lies…I just know my preference remains firmly with Rye. That being said; there are multiple preferences that enter into the making of a Manhattan beyond the base. Often bartender’s are asked to prepare a Manhattan with not just a preferred base but also a preferred brand, so make sure when you order to let your bartender know if you have a preference, ie calling for a ‘Maker’s Manhattan’ if you want yours served with Maker’s Mark Bourbon. Easy enough right…unless you want one of the many derivations that can be made. The differences beyond the base are determined by the vermouth included and the vermouth determines which garnish is used; cherries or lemon. Traditionally, a maraschino cherry was used, but I prefer my own cherries which are similar to ones you can find in gourmet shops. I simply cover fresh cherries with sugar, let sit for a day, and then add enough Luxardo Maraschino Liqueur to cover and allow to steep for a week minimum. This batch was made with some local sour cherries a friend gave me; but if those aren’t available, just use some Bing cherries. So worth either making or sourcing locally! A Manhattan is 2 oz. Rye or Bourbon; 1 oz Sweet Vermouth and a few dashes of Angostura bitters. It is stirred in a bar glass (never shake a Manhattan unless it is specifically requested, this cocktail should be cold and clear) and strained into a chilled cocktail glass and garnished with a cherry. 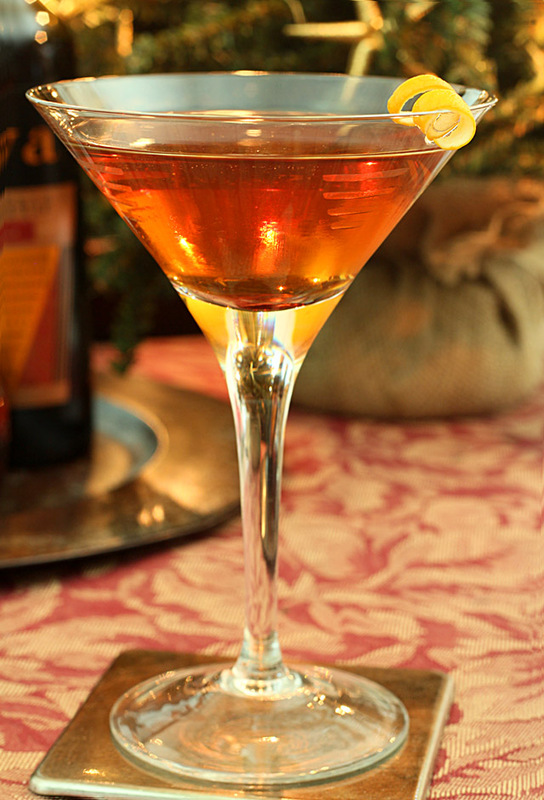 A Dry Manhattan substitutes the Sweet Vermouth with Dry and the garnish is a lemon twist instead of a cherry. A Perfect Manhattan might sound like a challenge but it really just means a combination of Sweet and Dry Vermouth; again with a lemon twist. The garnish rule is simple; use Dry Vermouth at all and the garnish is lemon. 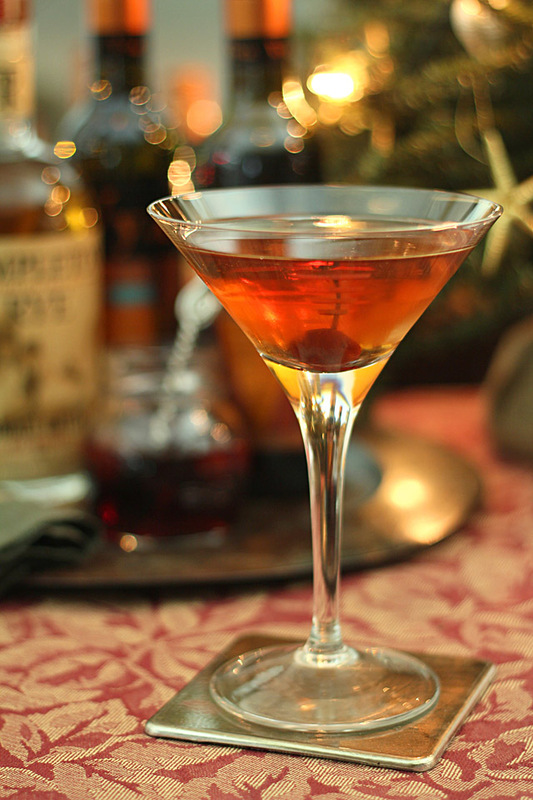 A Rob Roy is a Manhattan made with Scotch. Same proportions but a different base. A Southern Comfort Manhattan is made with Southern Comfort, Dry Vermouth, and a lemon twist for garnish. 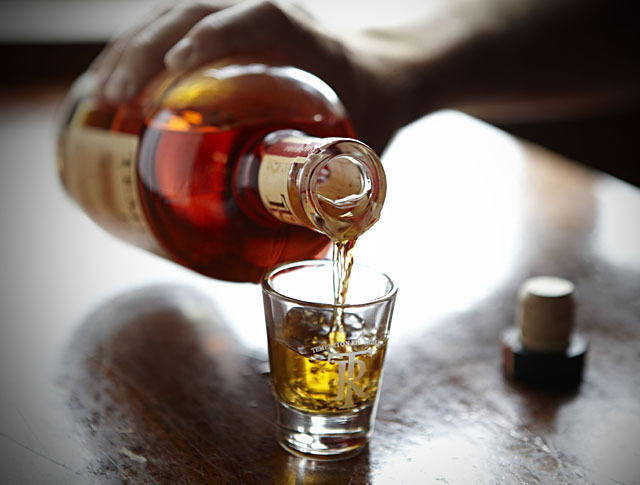 Last and not least…it can be served up or on the rocks. So many choices for just one little drink! For me…I like the Perfect Manhattan; sometimes straight up and sometimes on the rocks…I like to mix it up depending on the weather. I was asked if I would like to sample some Templeton Rye; a small batch brew from a distillery in Iowa. Yes, you read that right, Iowa. When I put a photo on Instagram of the new arrival, I was pleasantly surprised to see a response from someone who had just visited Iowa and came home with a bottle for herself. She loved it…and seems most reviewers do too. So, of course I thought it perfect for one of the few cocktails truly associated with Rye. I see now why they call it ‘The Good Stuff’ – it’s been around since prohibition and has a storied history, including being a favorite of Al Capone’s. More than eighty-five years later, the infamous small batch rye whiskey finally returned – made available legally for the first time ever in 2006. It’s a gorgeous amber color and I can’t deny my new love has been impacted by a taste that has some caramel/butterscotch undertones. The real Perfect Manhattan if you ask me. By the way, yes I do know that Christmas is over but my plans were to include this cocktail during the holidays; they did not include getting sick. SO…maybe a bit late but hey, if my tree is still up in the family room, guess it’s OK if my photos include one too, right? Fill a cocktail shaker about three-quarters full of ice and add the rye, vermouth and bitters. Stir with a bar spoon until the contents are ice cold. Fill two cocktail glasses and garnish each with a lemon twist. Shaken or stirred? For this cocktail I love the chill of shaken but the look of stirred. So I put my glasses in the freezer for about 10 minutes before making the cocktail and then I stir the ingredients with some medium size ice chips. If you prefer a more icy composition, they shake away but the clarity of the cocktail can be affected. Thanks to the folks at Templeton Rye I was provided with a bottle for review; all commentary is my own. 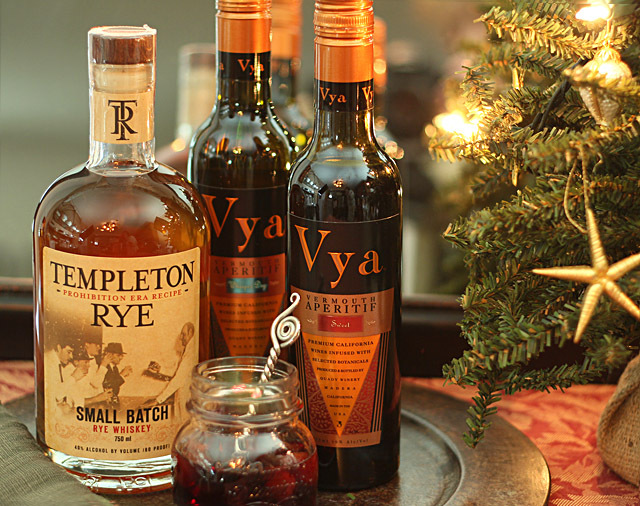 The Rye whiskey lends a much spicier note to the drink, which works nicely with the sweet vermouth to create a drink that is perhaps more balanced than a Bourbon Manhattan. The home-made cherry I used also adds the slightest hint of Maraschino which is much better than the plain sweetness a store-brought cherry brings. The Manhattan is one of my favorite drinks. Rye for me, please – I find bourbon too sweet in this drink (although I’m OK with using a maraschino cherry for garnish in a dry Manhattan; go figure!). Good post – thanks. Can I just say you are so awesome! Such a gorgeous cocktail, I want to try one soon! Of course you can…who would say no to that; made my day! They are a favorite here; especially after the crush of sweet, fun and pretty holiday cocktails. That is our favorite drink, great post ! Happy New Year! Thanks so much Diane and Happy New Year to you too! Looks absolutely wonderful and love the photos! Happy New Year! Thanks so much…I have a special love of taking beverage photos so always appreciate a kind comment! Happy New Year to you too. Try them…you will love them. Promise, promise, promise! Thanks for the Manhattan tutorial. I just always took for granted that a Manhattan was bourbon and sweet vermouth with a cherry in the glass for dessert. I’m ging to try it with rye next time. See, just proves the regional thing! Rye is almost unfair name; I think I expected something that was more reminiscent of rye bread…thankfully it’s not! First of all, I totally agree with Holly’s comment. Secondly, the Manhattan is my husband’s drink. He always uses Rye Whiskey, Angostura Bitters (very pricey in these parts) and Sweet Vermouth. He also garnishes it with a cherry but never eats the cherry. If I liked Rye I’d eat those cherries in a heartbeat. P.S. I often use a few dashes of Angostura Bitters in a lot of my cooking. Great flavour enhancer. Manhattan’s & Rob Roy’s are a staple around here, especially on steak night. My son’s prefer the Manhattan & The Col the Rob Roy. I’ve not been able to find the Vya, though. Gollnick swears by it. BTW, I use Lillet Rouge for a dryer mix. I ordered it from them I wanted it so bad…glad I did too! I might sound like a broken record but please let me know when you decide to offer a photography class! You know I’d be first to sign up. It could be yet another business venture for you, your photography is stunning! Hope you are back to feel well and ready to take on a new year. All the best!